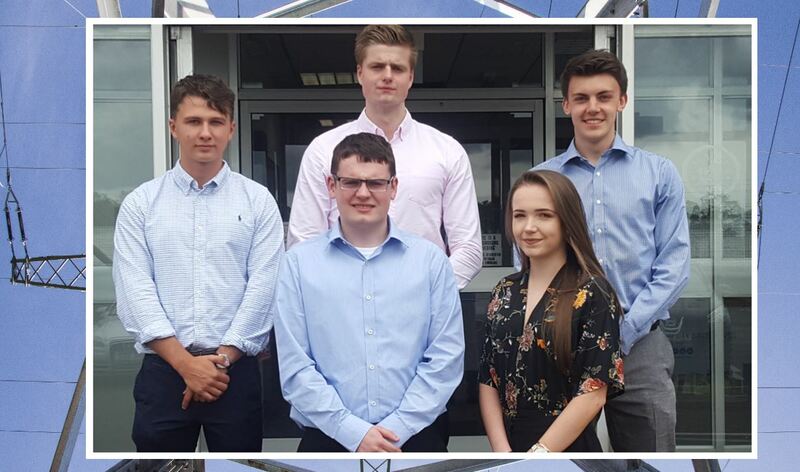 Five Queen’s Electrical and Electronic engineering students were awarded NIE Networks’ Scholarships this summer, which included generous financial support, an NIE Networks' mentor and highly valued experience within the power engineering sector. The NIE Networks’ Scholarship programme – now in its fifth year – is open to first and second year electrical engineering students at Queen’s. The scholarship, which is worth up to £36,000, includes an annual £2,750 bursary towards tuition fees, a £250 book and software allowance each year, a paid summer placement of 8 weeks throughout the duration of the scholar’s studies, a one year paid industrial placement, a NIE Networks' engineering mentor and student membership of the Institution of Engineering and Technology (IET). One of this year’s recipients, Timothy Watt from Banbridge, County Down (pictured right above), who is currently undertaking a Master’s degree in Electrical and Electronics Engineering, joined the company over the summer for his placement. Kerri Pollock, HR Advisor at NIE Networks said: “We’re delighted to welcome Timothy to NIE Networks. This is the fifth year we have run our scholarship programme that aims to help develop young engineering talent. We find that although there are excellent opportunities for well-paid, highly skilled careers within the power engineering sector there is a shortage of electrical engineering graduates to fill these jobs. Commenting on his award, Timothy said: “I’m delighted to have been awarded the scholarship and I’m really excited to get into my summer placement and experience a career as an engineer. With significant challenges facing the electricity industry over the coming years and an emphasis on renewable energy, ‘smart’ grid technology and electric vehicles, Queen’s NIE Networks’ scholars get ‘hands on’ experience, working on real projects, with the possibility of employment and a lifelong career in a sector that is continually changing. To learn more about the NIE Networks’ Scholarship please click here. Caption: This year’s NIE Networks’ Scholars are (L-R): (back row) Dean Morrow, Rowan Smyth and Timothy Watt and (front) Paul McCarron and Shona Burns.